If you have a Holiday Home in Spain or perhaps are lucky enough to live here full-time you will probably want to have a satellite system installed so that you can receive British TV from the UK. Over the years several "re-broadcasting" Companies have come and gone that will supply your British TV for €20 - €30 a month, what they do is install a massive dish in an elevated area such as on top of a Hotel and then re-broadcast the signal to your home and 10'000 or so other homes using encoded boxes. This service used to include SKY SPORTS & SKY MOVIES however since the big TV shake up on the Costa Blanca with Telmicro being shut down most of these Companies have removed the SKY SPORTS & SKY MOVIES. The 1.9 Portuguese dish can be installed on any flat roof, garden, patio, wall, and we can custom build special brackets for difficult positions where we need to raise the dish to get over a building or tree blocking the signal. You can choose to have a SKY BOX installed in Spain without the need of a SKY CARD, providing you are happy just watching the basic channels such as BBC 1, ITV, ITV 2, CH4+1, E4, MORE 4, SKY News, BBC News etc as these channels are not scrambled and can be viewed without the need of a sky viewing card in Spain this said however if you want to watch SKY 1 or UK Gold then a SKY card will be required, there are several Companies offering SKY Cards in Spain and most will arrange a new sky card with a UK address for around €200. We have included some prices (see below) of the cost of having a SKY package, they start from as little as €18 a month! So there is a package to suit every budget, you will be able to use your SKY+ or SKY+HD box to record TV programs and will have access to SKY anytime that automatically stores programs, films and sporting events on to the hard drive inside the sky box allowing you to watch programs when it suits you, sky+ box's have a 80GB hard drive and sky+HD boxes have up to 1500GB although half of this is reserved for sky anytime recordings. Freesat TV allows you to watch BBC 1, ITV, ITV 2, CH4+1, E4, MORE 4, SKY News, BBC News etc for FREE, and the Freesat branded satellite receivers allow you to record any TV show without having to pay a monthly charge, this service was created in a joint venture between the BBC & ITV to bring FREE satellite TV to the masses. The Freesat box of choice is without a doubt the 320GB Humax Foxsat HD PVR as it boasts twin tuners allowing for the recording of two channels at the same time. You will have read in the local Press and on many websites that the High Gain satellite dishes that are manufactured in Portugal, we use both the Marafa and Famaval Portuguese satellite dishes depending on customer preference. We also use the Invacom range of C120 flange LNB and when installing sky+ we have the latest Webro twin shotgun cable, not always supplied by other installers due to the high cost! We can install a concrete base for your dish or can fix to a wall, the 1.4 High gain dish that we use has become very popular as it can be installed with a receiver for under €400 and works perfectly From Torrevieja heading South using a special High Gain LNB and pre-programmed receiver. We have the best offers and pride ourselves in providing the latest equipment at the best prices. 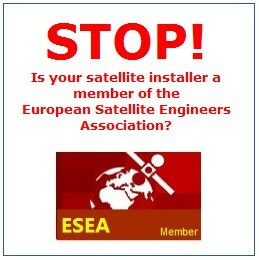 All of our SATELLITE ENGINEERS have been INSTALLING FREESAT AND SKY TV for more than 16 years and are members of the ESEA, We are based in Los Montesinos just 5 minutes from Torrevieja and supply the FAMAVAL PORTUGUESE Satellite dishes that provide the highest level of signal quality and are highly recommended for use on the Costa Blanca. We are installing daily in Torrevieja, Quesada, Villa Martin, San Miguel de Salinas, Cabo-Roig, Guardamar, Alicante, Benidorm, Murcia, Fortuna, Orihuela, Playa Flamenca & all other areas covered. Why not upgrade to SKY HD? 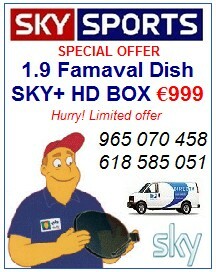 1.9 Famaval Dish and SKY+HD Box €999 fitted! 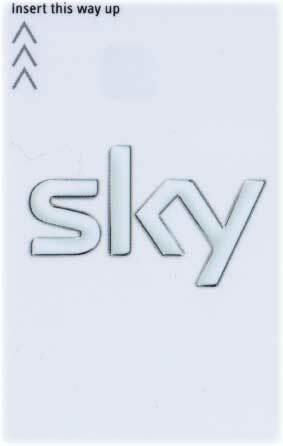 British SKY TV installers in Torrevieja Spain, suppliers and installers of the latest satellite TV systems including SKY TV using a UK SKY CARD or ROI SKY CARD with official SKY boxes, we also supply and install British UK FREESAT TV systems. If you are thinking of installing SKY TV or FREESAT TV at your property ion Torrevieja contact our friendly sales team by e-mail or call us on 00 34 618 585 051 we can assist you in getting the best possible system that will suit your property and your budget. We are suppliers and installers of SKY TV in Torrevieja using the latest high gain Famaval satellite dishes that guarantee you an excellent signal even in bad weather. We are proud to provide a fantastic service to all of our customers and work hard to ensure every installation results in recommendations that account for 50% of our Business. If you would like a trouble free installation contact us today. We have been installing SKY TV & FREESAT TV in Spain for over 12 years and have excellent knowledge on the latest equipment so that we can offer systems to cater to everyone's taste. We have a specialist home Cinema team that can turn that basement or under build in to your own personal home cinema of your dreams, and with cinemas from as little as €1'500 this has been incredibly popular on the Costa Blanca. We have also assisted people with homes in Spain but also in other countries by setting up sling boxes so that they can watch UK SKY TV or FREESAT TV anywhere in the World via the internet. Copyright BKTG SL Spain - Any copying of our content shall result in legal action. All rights reserved. Do not copy our content please create your own. TAKE A MINUTE TO LIKE US ON FACEBOOK. Call now 00 34 618 585 051 or SMS - "I WANT SKY"